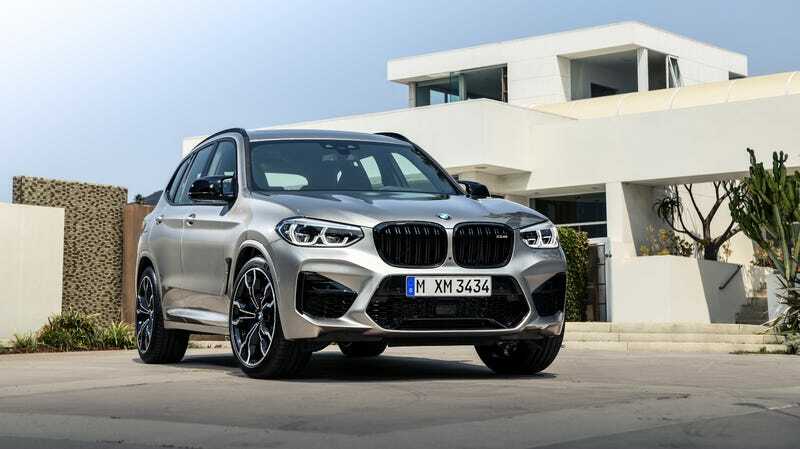 The new 2020 BMW X4 M and BMW X3 M (along with their Competition variants) have arrived to answer the question nobody asked. Someone is going to have to put a stop to all of this, but I fear humanity no longer has a champion against the M-ification of all BMWs. We lost many good ones in the battles against AMG, and I thought the X5 M and X6 M monsters had sated BMW’s appetite. But alas, here we stand, on the precipice of another tumble into performance SUV land. The X3 M and X4 M feature a new S58 3.0-liter twin-turbocharged inline-six engine which produces 473 horsepower and 442 lb-ft of torque. The Competition siblings receive a slight increase to 503 horsepower at peak. All of this power is pushed through an eight-speed automatic and an M xDrive all-wheel-drive system similar to that found in the current M5. The “regular” M siblings can sprint from 0-60 in 4.2 seconds, while the Competition variants can do it in 4.1. The M-ified X4 and X3 have terrifying “enhancements” to bring the car’s aerodynamics and visuals up to tactical weapons grade. It looks terrifying, particularly in the Competition’s high-gloss black accents. There is an optional M Carbon exterior package, which adds deadly carbon to the intakes, the front “air blade,” rear diffuser, and mirror caps. The X4 M and X4 M Competition also receive a carbon rear wing when you check the “M Carbon pack” box in your own blood. If you’ve got to have a cute ute with carbon bits and more power than you’ll ever know what to do with, you can join the side of evil, or you can join the resistance. Why is it that we can’t afford to lose this battle? What is it that is so threatened? Haven’t we already lost the war? Haven’t they already destroyed what it means to be an ///M car? The days of four-cylinder E30s are a long way behind us. But no! I won’t let them take away Competition, too! Rise with me, my friends. We cannot go gently into this Carbon pack night.